PI will be down for hosting service maintenance starting Saturday, January 31, 2009, at 6:00 AM EST. I’m not sure how long the outage would occur. It’s expected to last an hour or two. But stuff happens. Email will be down as well as the web site. I don’t think I will actually lose any email – I just won’t have access to it for awhile. But, just in case, if you send me email tomorrow and don’t hear back from me for a day or two, please resend. 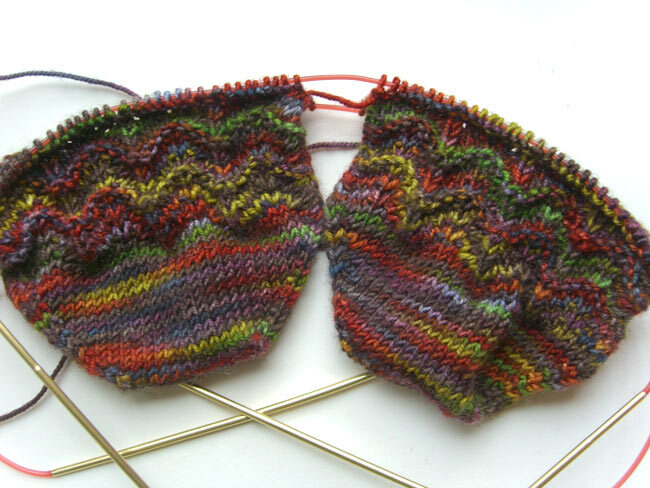 I know that, from this picture, it looks like I haven’t made any progress on the latest socks. They look very much the same as the last picture because I’ve frogged them back 3 times — twice just to the end of the toe increases, and once all the way. I just couldn’t get happy with the results of the stitch pattern. First I didn’t like the way I’d done the double-decreases. Frogged to start of stitch pattern. I tried a different double-decrease, and I didn’t like how it ended up looking like very narrow Jay Walker chevrons and didn’t play very well with the way I placed the toe increases. Frogged all the way. I tried a more standard feather-and-fan pattern, using KFB increases instead of YO because I didn’t think the colorway would play well with lace. I used KFB increases on the toes, too, to keep the whole theme going. 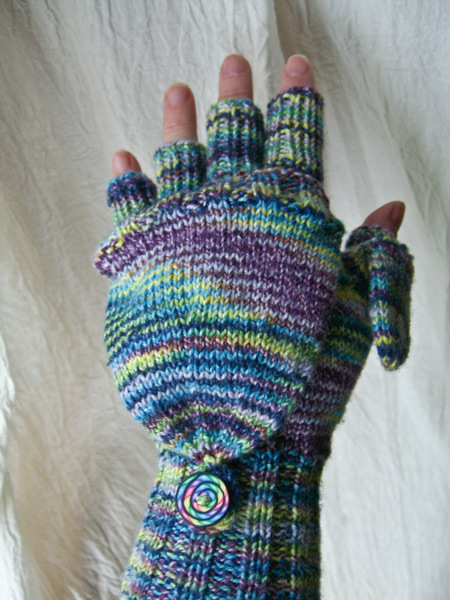 The pattern did not look good with the colorway. Frogged to start of stitch pattern. I’m sort of back where I started now. I’m using the double decrease from the second attempt, along with KFB increases. 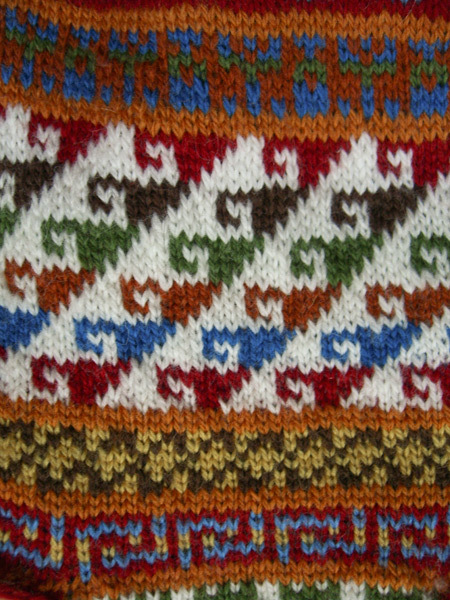 I don’t think it resembles the Jay Walker pattern too much now. And I like the way it’s working with the colorway. Also in the mean time has been this little root canal thingy. And new tires for #1 Son. And freezing fog along with another tiny smattering of snow. (text message from #1 Son: Snow. So. Over. It.) And, well… life. But I’m feeling that next two weeks are going to be good! For one thing, at the end of today I will be officially on vacation! Next week I’m heading up to Friday Harbor for Cat Bordhi’s annual visionary retreat, where, it is to be hoped, I will get something done on the book and get to rub elbows with some amazing people in a gorgeous setting. And right after that is the Madrona Fiber Arts Festival, where I’m taking a class from Nancy Bush and rubbing elbows with more amazing knitterly and fiberly types until Saturday. What more could I ask? So, if you are at Madrona, be on the lookout for me. I usually carry a blue knit bag dotted with buttons from Ravelry and PDX Knit Bloggers and Persistent Illusion and other stuff. Other than the one class I will be foot loose and fancy free, as the saying goes. Step up and say hello! Chapeau Marnier is finished and will be shortly in the mail to its intended recipient. What a fun, fast knit this was! Again, I really wish that I could adequately photograph this yarn. The sparkle in it is so pretty, without being over the top. It’s just then perfect amount of bling. But I don’t think a camera will ever capture it. You have to see it in person. Yarn: Stitchjones Glam Sock (63% superwash merino, 20% silk, 14% nylon, 2% silver), 420 yds per 3.5 oz/100 g skein, in colorway Silver — I used a fraction of the total and have tons left. Pattern: Chapeau Marnier by Marnie MacLean from the Summer 2007 issue of Knitty. Needles: a US#6 from my Denise set to cast on, and then knit on a pair of US#2 Addi Turbo circs. Ribbon: 1-1/2 yds of double-sided satin ribbon. 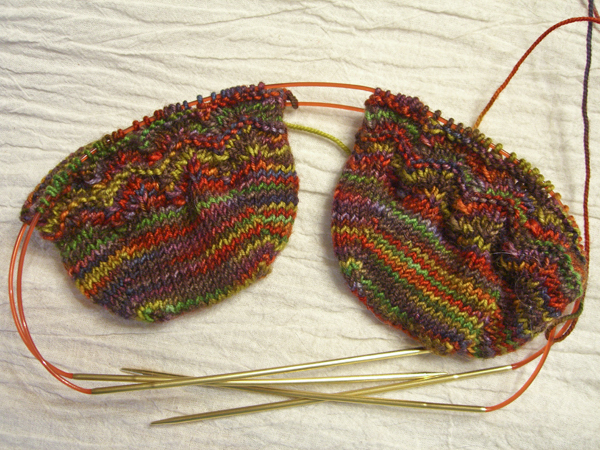 And, since 3 or 4 unfinished pairs of socks are, apparently, not enough… I cast on another pair. This was actually prompted by having to darn my Rooster Feather socks yet again. I’m afraid they are not long for this world, but I really like the feather-and-fan pattern I used on them. So I reverse engineered and started a new pair. The yarn is Blue Moon Socks That Rock in Jabberwocky. So I’m afraid these are fated to be called Jubjub Birds or some such atrocity. 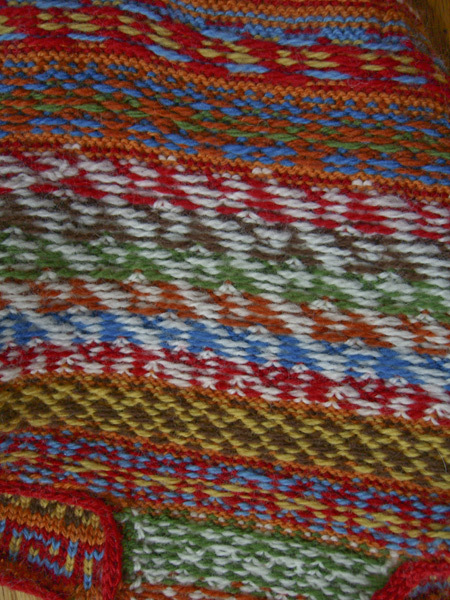 I’ve started Chapeau Marnier from the Summer 2007 issue of Knitty. 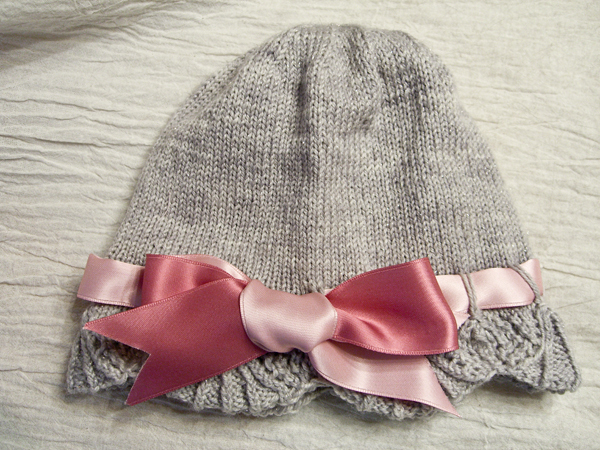 I’m knitting this hat as a chemo cap for a friend of a friend who is in need. This is the brim. It’s knit in a fun lace pattern. I’m up to the straight stockinette, now. We were asked to knit pretty things, and I can’t think of anything prettier than this lovely pattern in this amazing yarn. I can hear you out there, gentle reader, saying Judy has finally completely lost it. It’s gray. But… it’s not. It’s silver. Stitchjones Glam Sock in Silver, to be exact. I thought the silver would be fun, and also neutral in color. 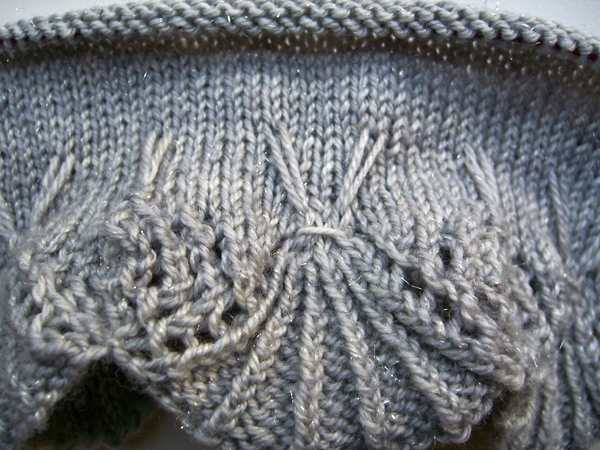 A ribbon trim is threaded through the elongated stitches you can see in the picture. FOF can change the color of the ribbon to suit mood or wardrobe. I have been trying unsuccessfully to photograph this yarn. I have tried all kinds of angles and lighting conditions and flash vs. no flash. This is the best I got. But it totally and completely fails to do any justice to this yarn. I swear the wound-up skein looks like a work of art. I’m exceedingly tempted to display it on my mantel like a small, gorgeous sculpture. But, with it’s mix of merino, silk (20% for nice sheen), nylon and real silver (that’s the sparkly bits) it’s too yummy not to knit with. Do click on the pic for the biggy version. Those little thin white lines and dots… those aren’t dust or digital artifacts – that’s silver sparkles. Perhaps the reaction of my non-knitting friend L will help to describe it. All L could say was, It’s so soft! . . . It’s so sparkly! . . . Yes, it is! And I have more of it in Santa Baby and my favorite Black Cherry. Ooooo… shiny! By the way, for all of you looking for the Andean Chullo Hat pattern or its kin, I have it on very good authority that Knit Picks will eventually have the kit back in stock. They were just totally surprised by the number of orders they received. Please take a deep breath and be patient and let them catch up. What happens when school’s out? Classmates go separate ways – to college, to marriage, to work, to ??? We become busy, wrapped up in what we are doing. We make new friends and new connections; ones that we now have more in common with. The things that were so important to us then — Mrs. Wood’s English class and the cute guy on the football team and who is going to the prom and with whom — fade into the universal background noise and are lost. Life takes over and carries us along on its inexorable tide and slowly we forget. So I was surprised when, just before Christmas, I got a voice mail from my brother saying that someone I went to grade school with was trying to get in touch with me and here was his number. I went to an 8-year grade school. There were 50 kids in my class. While there were a few kids who left or moved away during those 8 years, and a few new kids who joined, for the most part it was the same 50 of us together in one room for 8 long years. But only a couple of them went to my high school, and so I hadn’t seen many of them for years and years and years – way more years than I wanted to admit. I’m a curious sort. So after thinking about it for awhile, I picked up the phone and called Carl and told him who I was. And it turned out that Carl and Ralph and some of the other old cronies were drinking coffee together one day and got to reminiscing about old times and realized that 2009 is the (drum roll please) 40th anniversary of our graduation from 8th grade. (yes, I’m old. deal with it.) They’d managed to track down all but a few of us, and was I interested in getting together? Carl added me to the “found” list and forwarded me a spreadsheet of names that I hadn’t heard for… a long time. I called my cousin who was in the same class as I and got her on the list. And last Sunday I joined a planning teleconference with several people who don’t sound much like I remember, and probably don’t look much like I remember, either. But nobody had talked to my long ago BFF, Ann. We were thick as thieves for awhile there, and I thought we would be forever. All that teenage drama, you know – boyfriends and dances and first jobs and who and where and why and what… But… life happens and gets in the way. By the time we’d been out of high school for four or five years, we’d both moved to other towns and just sort of drifted apart. There was an old contact number on the spreadsheet, but nobody knew if it was still good. So last night I picked up my phone and dialed the old number, and Ann answered. I can’t begin to express how good it was to hear her voice, and catch up a little on how she is and where she’s been and so on. We might not be able to hook up at the reunion being planned, but we will find a way to hook up because we need to get together and talk about all that stuff way long ago… Mrs. Wood’s English class an that cute guy. And bring each other up to date, and start anew. And keep in touch this time. 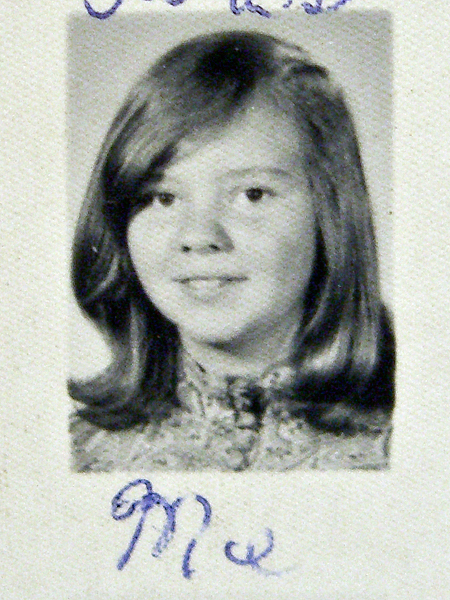 That’s me, by the way, from my 8th grade class picture. The picture had no names on it, so I wrote the names below the faces, just in case I forgot (and, it turns out, in some cases, go figure, I had). I’d even helpfully labeled myself. I wonder how long I fussed with my hair to get it that smooth. I remember ironing it sometimes, and setting it on soup cans in a vain attempt at getting it straight. I’m guessing this was soup cans, since it has a little flip at the bottom. 40 years later, I’ve finally given up. Thank you, for your kind comments on my secret projects. Both were a lot of fun to knit. I’ll have knitting content next time, maybe. But thanks for indulging this little foray into the past. This is Secret Project #1 that I have not been able to show you until now. 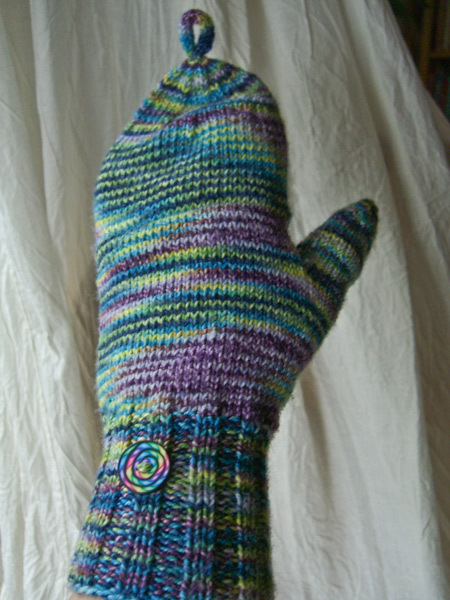 It was the last finished object of 2008. I am modeling these because I wasn’t sure of my ability to get #1 Son to pose. (click the pics to embiggen) They’re a little big on me, but fit him perfectly. 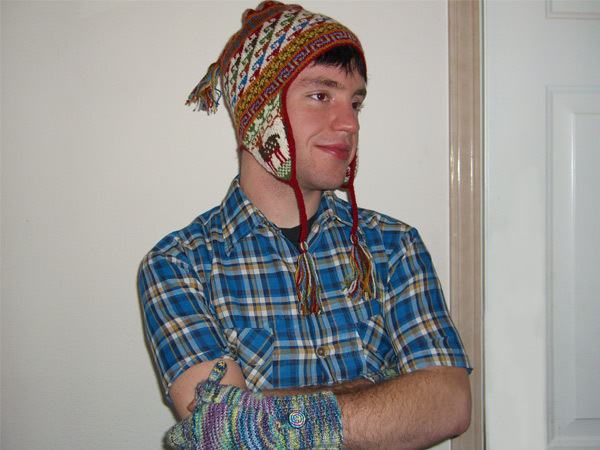 I had really a lot of fun knitting these. I made the thumbs also convertible, because that seemed cool and fun. It took me several tries to get a thumb I liked, but I’m really happy with the way that these turned out. The buttons were a happy find at Jo-Ann. They are made from a polyresin material that’s flexible, so the buttons won’t break and won’t hurt his wrist if #1 Son bangs them against something accidentally. 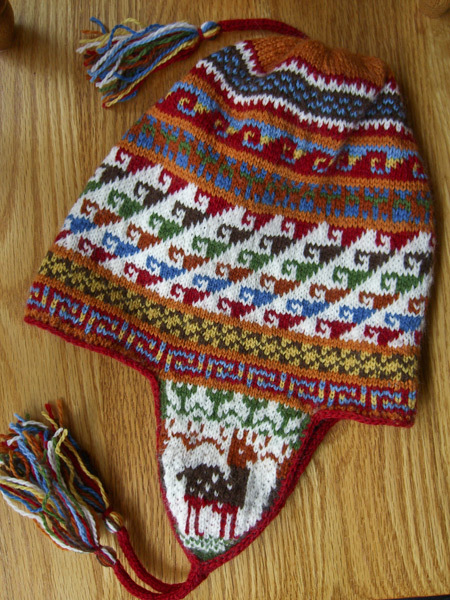 And this is Secret Project #2 – the Andean Chullo Hat Kit from Knit Picks. I made a pot of chili and a pan of corn bread. We ate and watched Mission: Impossible III on cable – which is way fun when you can cheer Tom on and jeer the bad guys and discuss the physical possibilities of actually doing any of the stunts in real life and why the heck can’t they get a better camera angle than that one and isn’t the technology and aren’t the gadgets just the coolest things ever? The chili came from a kit that was a gift from one of my cousins. The kit was made by the Women’s Bean Project, a nonprofit organization that helps women to transform their lives and move to self-sufficiency by teaching entry-level job readiness and life skills. My kit came with enough for two batches of chili – one Firehouse and one Mild – and spices for two batches of salsa. The chili mix comes with the beans and spices, and you add a can of tomatoes, onion and green peppers. I had made the Firehouse chili earlier in the week, and found it very mild and in need of salt. #1 Son and I both like our chili pretty hot, and if that was the Firehouse I couldn’t imagine how mild the Mild would be. So, besides the tomato, onion and green pepper, I added a bit of salt, a big Anaheim chili and about a tablespoon of dried chipotle chili. ( The kit suggested adding a teaspoon of chili powder if desired. teaspoon… hahahahaha) I’m not sure how much chili I added because I poured it in until I thought it looked like enough but it was probably around a tablespoon. For some reason the beans refused to soften up all the way – and I’m sure that was cook’s mistake somewhere, although I followed what I usually do with dried beans. But I was also trying to get a hat finished, so I may have been distracted. At any rate, some of the beans had a sort of al dente texture – nice in pasta but not quite what you want in beans. But the chili tasted wonderful! #1 Son ate two helpings and took the leftovers home. The cornbread was from the recipe on the back of the Albers Yellow Cornmeal box. It’s the recipe I’ve always used – fast, easy, and comes out great. #1 Son’s take on dinner: Perfect chili, Mom! Good and hot, but not so hot that it’s not really tasty. What kind of chli did you add? Good choice! And you always make the best cornbread ever! I tell all my friends how good your cornbread is.